In a eyebrow-raising 4,000-word exposé, "Foreign Powers Buy Influence at Think Tanks" published in the New York Times on September 7, Eric Lipton, Brooke Williams and Nicholas Confessore look into the novel issue of foreign governmental financing for American think tanks. The trio found that while the total scope "is difficult to determine ... since 2011, at least 64 foreign governments, state-controlled entities or government officials have contributed to a group of 28 major United States-based research organizations." Using the sketchy available information, they estimate "a minimum of $92 million in contributions or commitments from overseas government interests over the last four years. The total is certainly more." In exchange for this largesse, the research institutions in question offered their donors two main benefits: One, they pressured staff members both to "refrain from criticizing the donor governments" and "to reach conclusions friendly to the government [that had provided] financing." And two, they have been "pushing United States government officials to adopt policies that often reflect the donors' priorities." The result: Overseas money has thrown doubt on the legitimacy and objectivity of think-tank research while "increasingly transforming the once-staid think-tank world into a muscular arm of foreign governments' lobbying in Washington." Some of this funding has been given clandestinely, with think tanks taking money under the table while benefiting from a moral image of disinterestedness. 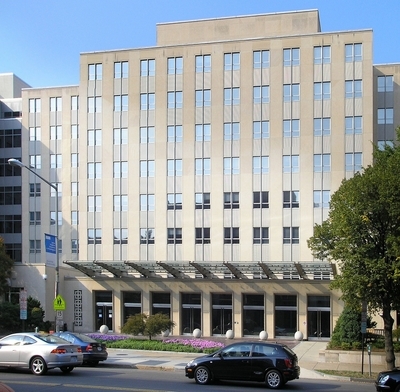 In the most prominently egregious example, the government of Qatar, as the NYT reported, "funneled hundreds of millions to Hamas-led Gaza and encouraged its rocket and tunnel assault on Israel," also signed a four-year $14.8 million deal in 2013 to fund the Brookings Institution where Martin Indyk serves as vice president and director of the Foreign Policy Program. Indyk worked for Secretary of State John Kerry from July 2013 to June 2014 as special envoy for Israeli-Palestinian negotiations. As someone on the same payroll as is Israel's mortal enemy, how could Indyk be expected to act in a neutral way? 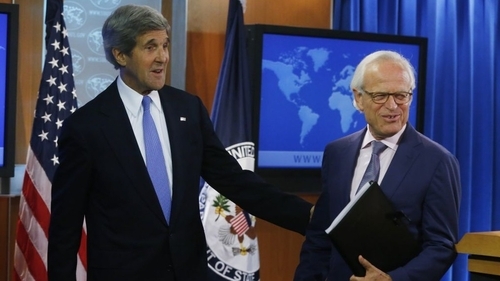 Martin Indyk (right) with his former boss, Secretary of State John Kerry. The president of Brookings, Strobe Talbott, not only did not apologize or show a shred of embarrassment that foreign governments underwrote some 12 percent of his funding, but had the temerity to respond that "think tanks should take money from foreign governments." Deploying such self-serving buzzwords as "governance" and phrases like "the philanthropic culture is changing," he fatuously argued that it "is entirely appropriate for us to work with [governments] when we have the capacity to contribute analysis and prescription on issues that they are dealing with in the policy realm." 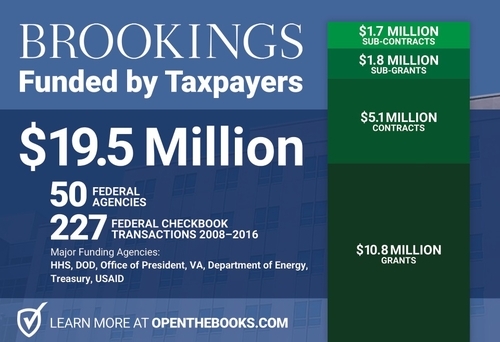 The Brookings Institute, founded 1916, is both the oldest American think tank and a leader ​in taking monies from foreign taxpayers. 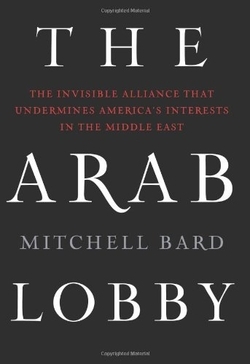 Mitchell Bard tells about the real Middle Eastern lobby working in Washington. Similarly, concerning the Middle East, where the article mentions several countries (Bahrain, Kuwait, Qatar, Saudi Arabia, UAE) whose governments play this influence-and-opinion-buying game, not one of them is called Israel. This pattern emphatically verifies the thesis presented by Mitchell Bard in the subtitle his 2010 book, The Arab Lobby: The Invisible Alliance That Undermines America's Interests in the Middle East (Harper). As Steven J. Rosen, formerly of the American Israel Public Affairs Committee, notes, if "measured by level of effort, if not results, the Arab lobby is equal, or superior to, anything done by the friends of Israel." Finally, the Times exposé placed all think-tanks on the defensive. If white-shoe organizations like Brookings are on the take, none of us is exempt from suspicion. In this light, the organization I head (slogan: "Promoting American interests") immediately issued a press release, "The Middle East Forum Takes No Funds from Foreign Governments," which stated unequivocally that "we have never sought or taken funding from any foreign government, nor from any agent of a foreign government. And we never will." More broadly, as John B. Judis argues, "foreign funding of think tanks is corrupting our democracy." Therefore, it's time for all research organizations presenting themselves as providing objective analysis to take a similar pledge, or else to label clearly who bought and paid for their conclusions. Aug. 8, 2016 update: MEF responded to the latest revelations about corruption in research institutes, this time on the part of corporations, with "MEF Accepts No 'Pay-to-Play' Funds from Businesses." Dec. 6, 2016 update: The London-based International Institute for Strategic Studies, one of the world's leading think tanks, has taken in £25 million in cash over five years, or more than a quarter of its income, from the Bahraini ruling family, the Guardian revealed today. Worse, confidential documents seen by the Guardian "reveal that IISS and the Bahraini royals agreed to 'take all necessary steps' to keep most of the donations secret." Comment: This news does incalculable damage to IISS' reputation. June 2, 2017 update: Writing for Forbes, Adam Andrzejewski shows in "Brookings Institution -- The Progressive Jukebox Funded By U.S. Taxpayers" that Brookings took in $19.5 million since 2008 in grants, sub-grants, contracts, and sub-contracts from the U.S. government, including $23,000 in 2015 from Barack Obama's "Office of the President" for employee training. Andrzejewski sums up his research: "In many cases, Brookings doesn't resemble a think tank, but a jukebox – add a little coin and Brookings will play your tune, if the price is right." May 14, 2017 update: Brookings is at it again, sending Martin Indyk to Doha to sign "an agreement to carry out a research project on the relationship between the United States and the Muslim world." The amount involved is not specified. 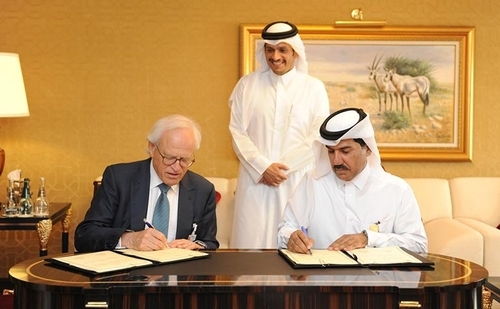 Martin Indyk and Ahmed bin Hassan Al Hammadi signed an agreement in the presence of the Qatari foreign minister. June 5, 2017 update: How awkward: The cutting of all relations by the Saudi, UAE, Egyptian, and other governments with Qatar won't make life easier at Brookings' Center for Middle East Policy. Aug. 9, 2017 update: Now comes news that one of Washington's sleepiest think tanks, the Middle East Institute, has secretly received a whopping $20 million from the United Arab Emirates' government in 2016-17 via The Emirates Center for Strategic Studies and Research (ECSSR), an Abu Dhabi-based think tank. augment its scholar roster with world class experts in order to counter the more egregious misperceptions about the region, inform U.S. government policy makers, and convene regional leaders for discreet dialogue on pressing issues. The agreement comes from the leaked e-mail account of the UAE ambassador to the United States, Yousef Al Otaiba. Presumably, the "egregious misperceptions" concern Qatar. Bilal Saab is one of the "world class experts" hired with the money. The report also contains juicy details about relations between Otaiba and both the Atlantic Council and the Center for a New American Security. "Ambassador Yousef Otaiba kindly informed our chairman, Richard Clarke of the ECSSR grant," Wendy Chamberlin, MEI's president, wrote to Saif Al Hajeri in September 2016. Otaiba was blind copied on the note, which he had previously proofread and suggested be delivered to both Hajeri and to Dr. Jamal Al-Suwaidi, head of ECSSR. "We are most appreciative of your support and ask that you acknowledge this letter as accurately reflecting the understandings," Chamberlin wrote to Suwaidi, helpfully including MEI's bank account details so the funds could be transferred. "Hajeri asked that I provide him with a document expressing this understanding, something about MEI and the Campaign Fund for his records. He said he had already spoken to the Crown Prince, who is the Chairman of his Board and that the paperwork is merely a formality for their own internal audit and records. "He said the funds would come from Tawazun, from a fund they had created into which companies owing offsets could donate cash in lieu of projects. He stressed that he did not want us to contact the companies." The payments were broken up into four lumps of $5 million each, but there was a hiccup. Hajeri was uncomfortable about how the donation would look if it became public. In July 2016, Clarke wrote him, copying Chamberlin, with reassurances. "MEI plans no announcement of the contribution," he assured. "In November, at the Annual Banquet and 70th anniversary, i will say that we are half way to our goal of $40m in pledges, from a variety of our past friends and donors." In 2017, he added, they would be required to file a public tax return with the government. "That will identify all sources of revenue. Because we are a Not-for-Profit institution, our filing will be available for public inspection. It is possible a reporter might look at the file and write a story, but that also may not happen," he advises. "We understand that you do not want to brag about the gift or have something named after you, but we believe that steps to 'hide' the contribution would not be a good idea. It would look like we are trying for some reason to cover up the relationship. That would provoke questions and suspicion. We are proud of our long history with the UAE." In October 2016, Clarke reached out again to Hajeri. "Yousef said he discussed with you the delay that we have incurred with Dr. Jamal," Clarke fretted. "We are at the point of starting construction, but can not proceed without the fund transfer." Hajeri replied and copied Otaiba. "I had a meeting with Dr. Jamal this afternoon and we agreed on the way forward," he said. "I am transferring the 20$ M tomorrow to the ECSSR and they will directly transfer them to the institute." On August 30, New America president Anne-Marie Slaughter terminated the left-leaning think tank's relationship with scholar Barry C. Lynn and his Open Markets program. Slaughter says that Lynn was not abiding by New America's "standards of openness and institutional collegiality." 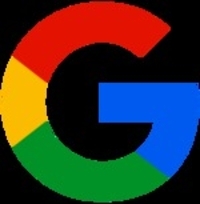 He says he was fired for his staunch antitrust views on the biggest technology companies and, in specific, his praise for the EU's decision in June to levy a $2.7 billion fine on Google for unfair market practices. In an ideal world, think tanks offer a place both for policy-minded scholarship and for refugees from politics, academia, and the media who might otherwise have no institutional support. At their best, they generate ideas that can improve policymaking and inform the public. But pay-for-play is a deepening ethical challenge for these institutions. 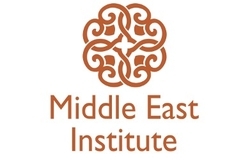 it is unclear exactly how far the Middle East Institute's new policy goes. Clarke measured his words, saying the institute won't accept any Saudi funds "at the moment." He said the organization also won't return any of the $2 million it had previously received from the Saudi Embassy in Washington. Dec. 7, 2018 update: More purchased opinions at Brookings, this time money from Huawei Technologies, Inc., the Chinese telecommunications company. It contributed between $100,000 and $249,000 to Brookings in the period July 2012-June 2013 and at least $300,000 in the period July 2016-June 2018. The report included a case study praising the Kenyan capital Nairobi and the Chinese city of Lijiang for implementing new technology in policing. What the report failed to mention is that the controversial Chinese telecommunications giant Huawei provided the technology for both cities, or that Huawei is one of the world's leading sellers of Safe City equipment, which the company describes as "cutting-edge" security to improve policing and oversight. 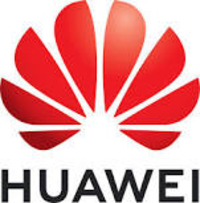 The Brookings report did, at least, disclose who provided support for the research: "Support for this publication was generously provided by Huawei." In other words, Brookings praised Huawei's technology in a report sponsored by Huawei. In 2014, West spoke at Huawei Innovation Day in Milan. ... At that Huawei-sponsored event, West took Huawei's side. "I think the way that Huawei has been singled out by the U.S. government has been unfair and counterproductive," West said. West has spoken at several Huawei events. ... West attended Huawei's fourth annual European Innovation Day in Paris in 2016, where he shared "his thoughts on how wireless technology is reshaping our lives," according to a Huawei press release. But West's most eyebrow-raising speaking event came in November 2017, when he presented the findings of his October report at a Huawei conference in the Malaysian capital Kuala Lumpur. Huawei's website posted a story entitled "Brookings Institution releases report ranking global cities on public safety innovation at Huawei Asia Pacific Innovation Day 2017," featuring a photo of West speaking. The PowerPoint presentation is online. The slides feature the Brookings logo — but a sentence in small font on the last slide includes a copyright, which Horne said "was not in our version of the final slides," and so "we are contacting Huawei and asking them to remove it, as it is not accurate." It reads: "Copyright©2017 Huawei Technologies Co., Ltd. All Rights Reserved." Is a Syria-Israel Treaty Good for the United States?